I sincerely hope that we see a return to baseline temperature conditions in the Arctic soon. But as the days roll by, this seems less and less likely. Warm winds keep flowing in both from the Barents and the Bering. And the centers of coldest Northern Hemisphere regions are well displaced toward Siberia and Greenland. If this situation continues, implications for summer sea ice during 2017 could be pretty rough (more on this in the follow-on post). And it’s at the point where we hit ice-free summer states in the Arctic Ocean that some very radical regional, hemispheric, and global changes (which produce even worse effects than some of the bad outcomes we’ve already seen) will be well underway. To look at Donald Trump’s version of what makes America great is to take a retrograde step through a rip in space-time and enter a fake populist bizarro land. To venture into an alternate dimension where a once-mighty and enlightened nation was strong-armed into taking the downward-sloping path into crisis and collapse. And like the bizarro land of the Superman mythos, this alternate reality is trying to inflict itself on the real world. It will succeed if we let it. Trump’s a man who’s angrily proud of the fact that he does not pay taxes to support the safety, security and prosperity of the nation he seeks to lead. He’s a billionaire pandering to white workers’ fears of economic disenfranchisement while fighting to cut the very social and economic supports that these voters often rely on. A red-faced fear-monger blaming innocent immigrants and African Americans for economic woes his party — the republicans — engineered through forty years of trickle down economics. Policies that party is seeking to enforce through an unjust suppression of voters in places like North Carolina and Florida. Donald Trump has often sought the populist mantle Bernie Sanders rightly bears. But Trump, Sanders says, “is an ignorant man, a vulgar man, a man who reminds me of Adolph Hitler and Josef Stalin in his arrogance and thirst for power.” And as Bernie Sanders goes to bat on the campaign trail for Clinton, pledging to make Trump — “start paying his fair share in taxes,” the rage-filled corporate mogul tars the career public servant Hillary Clinton, attempting to smear her with the same Wall Street trappings Trump of Trump Towers ignominy has worn since the day of his birth. In other words, it’s one thing to take campaign donations from Wall Street, but another thing entirely to live, eat, and breathe the Wall Street mantra. To support, as Trump has throughout his life, the same harmful tax cut, deregulation, and anti-minimum wage policies that created the problem of Wall Street vs Main Street in the first place. To live in Trump’s reality is to live in an America under a strange kind of upside down siege. If the real economic problem in America is income inequality — then Trump promotes more of it. If the real threats to America’s foreign policy endeavors are increasing isolation and alienation of our allies — Trump seeks to build a wall. If dictators imperil our country or disrupt our elections, then Trump praises them. And if the very real climate change spurred threats such as coastal inundation facing cities like Miami, Norfolk, and Elizabeth City and drought losses threatening the water supply of the Colorado River states are ever-worsening, Trump seeks to burn more coal, oil and gas, attacks renewables, and denies that climate change is actually happening. If abuses by the powerful have created harm in America and abroad, Trump talks up abusive strong-men like Russia’s Vladimir Putin. And Putin, for his own part, appears to have done everything he can to help Wikileaks hack Hillary Clinton’s emails or even post fake versions of emails to further misinform the American electorate. Trump seems to believe that we can transport ourselves back to a mythological past when America was greater than it is today. To promote the illusion that we are, somehow, not far better off now than we were at a time when African Americans were held as slaves, or suffered under the abuses of Jim Crow, when scientists were persecuted, when there were no labor laws preventing the exploitation of children or protecting workers’ rights to fair pay and treatment, when women had no right to vote, when the abuses of state-supported corporate exploitation by such entities as the East India Trade company led to the real Boston Tea Party and wholesale continental revolt, and when a policy of systemic genocide was enacted against the natives who lived on American soil for thousands of years before the colonists came. What Trump’s lack-vision fails to see is that America’s aspirations for greatness led her out of a very dark time scarred by these ills and into the far more enlightened age of today. An age that is now under threat by the retrograde narratives and policies promoted by people like Trump who seem to push ever on toward a return to the old dark days of injustice and oppression. And this mindset, the abusive and revisionist view of history, is something we must reject if we are to have much hope of navigating the very serious troubles that are coming in this age global climate change and increasing dislocation. We must embrace new ways of doing things. We must turn to new leaders. We must reject the political violence of an old, angry white man, and the system of dominance and harm that he promotes. This is my endorsement for Hillary Clinton. A woman whom I admire for her strength, her tenacity, and her clarity of purpose. I may not agree with every policy she stands for or admire every aspect of her life. Like the rest of us, she is human and imperfect. But she is a true American who has served her country with honor. A lady who supports our America not just with her words, but both through paying a fair share of her substantial earnings and through her considerable life’s work. A leader I can stand behind. Someone who has already done many great things for this nation and who I believe, with the help of people like Bernie Sanders, is capable of so much more. In a day when we face off against so many abuses both at home and abroad, I think America would benefit from the steady hand of this strong woman — who has the potential to be a truly historical figure and to lead our nation out of a sea of troubles. Donald Trump represents the worst sins the old world, but if we give Hillary the right kind of support, she can stand for the better virtues of tomorrow and serve the vision of an age that confronts its problems rather than spiraling ever deeper into self-destructive denial, anger, and isolation. That’s what this election means to me — risking an almost assured disaster by electing Trump or creating a very real possibility for reducing and escaping present harms if we elect Clinton. The choice, for me, couldn’t be clearer. So I urge you to lift your voices in this election. To be heard and to make your power and capacity to promote justice known. I ask you to stand strong against the intimidation, against the pervasive misinformation coming from those who would inflict so much harm. You are capable. We are capable. We can do this. We can release America from the siege that a fake Tea Party promoted by corporate interests and that people like Trump have placed her under. And we can make a strike against the underlying systemic mysogyny of our nation by electing our first female President of this United States of America. I have listened to your voices and I know that you are strong. So be heard! It is time for the real America to shine through. On a world in which fossil fuel burning is now in the process of setting off various events of geological scale, one of the things we could well hope for most is a peak in fossil fuel supply. Such an event would force countries and economies to adjust. To abandon business as usual economics and to rapidly shift to approaches that enhance and reinforce lifestyles and energy consumption behaviors that do not radically alter the world’s environment for the worst. But, unfortunately, as we will see below, there is more than enough oil, gas, coal, brown coal, fracked oil and gas, gas hydrates, tar sands, kerogen and other fossil fuel stores to continue burning for years, decades and perhaps even centuries to come. So to hope for peak fossil fuel use, unless that peak is determined by responsible individual, community, and political action, is a false hope. An end that sets off terrible consequences. Even worse than those difficult to deal with problems we’ve already locked in. Back in the mid 2000s there was an oil industry energy consultant by the name of Matthew Simmons. And Simmons had developed a laser-like focus on a massive store of ‘easy oil’ in the deserts of Saudi Arabia. This store was locked in the great oil field called Ghawar. A self-pressurized dome that originally contained about 80 billion barrels of the hothouse gas firewater we call oil. Prick Ghawar with a drill and the stuff just came erupting out. Deceptively clear for all the btus of global atmospheric heating it contained. At some point, the black magic of Ghawar began to fade. Saudi Arabia started to inject water into the Ghawar well to keep the oil flowing. This required more energy and increased costs. For Saudi Arabia and much of the world, the age of easy oil was coming to an end. Simmons declared that peak oil was just around the corner. That global oil production couldn’t exceed 85 million barrels per day. And that the new, unconventional sources — locked in tight oil deposits and tar sands — were too difficult to extract. 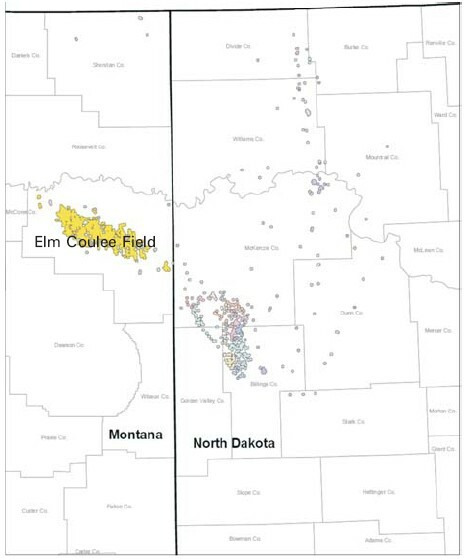 Peak oil analysts declared that the Bakken would never exceed a flow rate of 100,000 barrels per day. 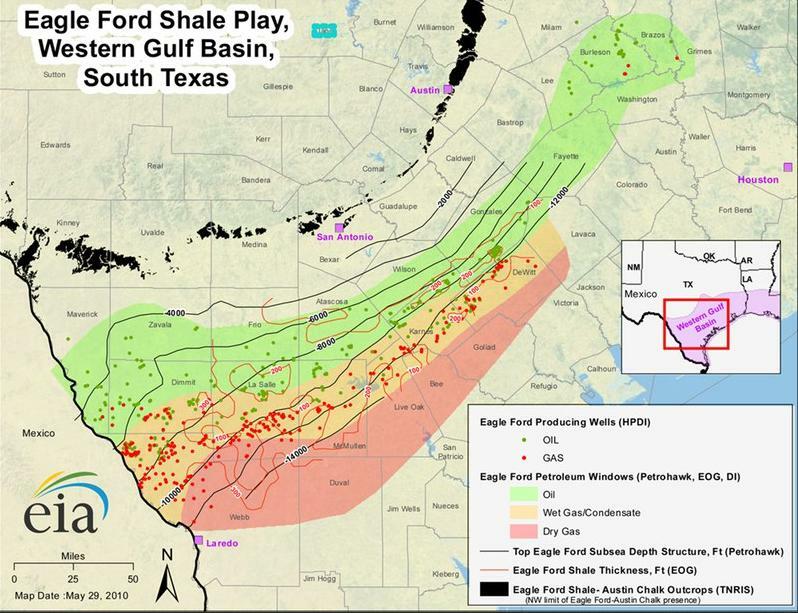 And the Eagle Ford Shale basin was just a glimmer in the eye of most analysts. Risks for an imminent peak in world oil supply did seem quite high. For some, for conservationists and those who are justifiably very concerned about the impacts of continued fossil fuel based carbon emissions on the world’s climate systems, the notion of an imminent peak in world oil supply came as welcome news. It would force economies to adjust to new structural and environmental realities and it would help to prevent some of the worst impacts of climate change. Certainly, there were still massive volumes of coal and natural gas to consider. But a peak in world oil production would lead to a variety of consumption reductions as well as help to advance renewable energy technology — so long targeted for delay and denial by oil and fossil fuel interests through their wealthy political backers. For most market analysts and economists, peak oil was never an object. They believed the magic of market economics would always provide a new resource and that the price signal would be enough to produce more resources of different varieties. But these analysts were somewhat blind to the broader impacts of large governmental movements and of investment or failure to invest in new resources by communities, states, and policy-makers. In many ways, all of these analysts held somewhat correct views. But contained to their narrow focus, they failed to accept where the others were correct or to see their own short-comings. A vocal portion of the peak oil analysts, led by Simmons, retained a narrow, and primarily easy oil and fossil fuel centered world-view that not only denigrated the effectiveness of new oil technology to over-come any peak oil situation, but also blithely dismissed much of the potential for renewables to take up for new energy production. They held a rigid view that only radically reduced consumption (and related implied wide-scale poverty and collapse back to 19th century standards of living) would result from peak oil and that such reduced consumption and collapse was needed and, indeed, would happen whether we liked it or not. Some conservationists seemed to glom on to the notion that renewables were not a desirable solution and this led steam to the anti-renewables faction. Though the push for lower consumption from peak oilers and conservationists was somewhat helpful, without the renewable option their world-view led to more implied reliance on fossil fuels through active denial of alternatives. And it left the door wide open for new oil related extraction technologies to come charging in absent any wide-spread renewable energy adoption. The market analysts were labeled ‘cornucopians’ by the more militant peak oilers or related agitators. In fact, this was a term that seemed to include anyone who supported any technology whatsoever, including sustainability based technical solutions. Contrary to peak oilers, the analysts pushed a view that the supply crunch, at first, wouldn’t happen. And, when they were proven wrong, went about cheer-leading for the new fracking technologies and for opening up the unconventional oil basins. An outside group of progressives pushed hard for new renewable resources. And, given the opening provided by high fuel prices, they were partially successful, despite the constant attacks coming from renewable energy detractors and in spite of a broad front of oil industry advanced extraction technologies competing in the energy investment sector. Consequent to Simmons’ warnings, a peak in conventional fuels did happen during the period of 2006 to 2008. Prices rocketed and economies were jarred by the shock. A shift toward more renewable energy and efficiency was driven by the crisis. Consumption fell and the world economy stalled in a combined energy and market derivatives crash. But the market signal and increased prices for energy unlocked technology that lead to the rapid expansion of production in Bakken, Eagle Ford, in Canada’s tar sands and in other far-flung basins around the globe. Today, the wretched energy and carbon intensive and highly polluting process that is fracking now squeezes 1 million barrels per day out of the Bakken formation. It wrings 1.7 million barrels per day out of the Eagle Ford formation. Add this staggering production gain to other fracking and conventional extraction efforts across the country and we find that the United States now produces a staggering 13.9 million barrels of liquid fuels per day. This makes the US the highest volume liquid fuels producer in the world on the back of a terrible breaking of the ground and increasing extraction of a fuel source that is already in the process of wrecking the world’s climate. Globally, despite struggling production in the Middle East and elsewhere, production of the firewater continued to rise. Canada’s tar sands production spiked to more than 2 million barrels per day with the Arctic state planning for a jump to 5 million barrels per day by 2030. An ongoing carbon bomb explosion that, by itself, could well be described as a tract of human-generated flood basalt. These and other oil sources combined with enhanced extraction to push global daily oil production from 85 million barrels per day during the mid 2000s to approaching 92 million barrels per day in 2014. This on the back of oil reserves additions in the form of tar sands at 168 billion barrels of extractable oil (total reserve at around 300 billion barrels), Eagle Ford at 10 billion barrels of currently recoverable oil (total reserve at 80 billion barrels), West Texas at 30-75 billion barrels of recoverable oil, Bakken at 7.3 billion barrels of recoverable reserves, and many other regions around the world that are now seeing new oil extraction or enhanced oil extraction. So Simmons was wrong on the issue of oil peaking at 85 million barrels per day, and many peak oil analysts along with him. And so it goes with the global fossil fuels story. As of 2014 we burn more oil, gas and coal than we ever have and global peak oil has again been removed to some future date. The global carbon emission is now enough to completely overshoot the lower range IPCC emissions scenarios and we are staring down the face of the highly unpleasant middle and worst case ranges. So in this respect, a number of peak oilers were dreadfully wrong — peak oil did not save us from climate change. In fact, bad effects are now locked in and the debate has shifted to whether or not there is enough extractable oil, gas and coal to hit the worst case scenarios. But if history doesn’t repeat itself, it does rhyme. For now it appears that both Eagle Ford and Bakken, due to the nature of rapid fracked well depletion, will peak sometime during 2016 and 2020. And the peak oilers are now having a bit of a rally, as challenges to global production, many of them political, are also continuing to expand. The environmentalists and scientists, thankfully, appear to be on the verge of successfully putting a crimp on Canada’s tar sands production. The US has sanctioned Russian oil production and a massive set of Arctic and shale reserves many times the US tight shale reserve hangs in the balance (a resource of ultimate reserves on the order of 1.2-2 trillion barrels of oil of oil in place). Barriers to fracking are rising and companies, facing a production glut today and investor uncertainty tomorrow, are in the process of consolidation and retraction. China is pledging to vastly reduce fossil fuel consumption growth and many oil exporters are beginning to wonder if they’ll have a market for their products there. Around the world, the situation is similar as governments and consumers both push for less use of dirty, dangerous, depleting and costly fossil fuels. In addition, renewable energy and alternatives have never been more widely available. Solar panel costs are down and EROEI is up. Wind power beats fossil fuel generation in most markets even when considering a natural gas glut due to fracking. Electric vehicles continue to become more widely available and CAFE standards around the world keep rising. An expanding movement is afoot to shift diets to less meat intensive ones — thereby pushing for a reduction in both the land and fossil-fuel use footprint of agriculture. And all these changes aim directly at reducing fossil fuel demand and consumption, generating impetus, along with the political movements targeting both new and old sources for an artificial, voluntary peak in fossil fuel flows. And this is exactly what we would desire, a direct refusal of business as usual economics. A voluntary taking on of responsible action, economic transition, and behavior change needed to reduce and eventually eliminate an extraordinarily damaging carbon pollution. As has been said, the Stone Age didn’t come to an end for lack of stones. And this could well be the case with fossil fuels, if we actively make that choice. Whether or not it happens essentially depends on people’s perception of the need for it to happen. But the voluntary peak is no-where near a pre-ordained certainty. There is an extraordinarily strong array of political forces aimed at both denying the existence of climate-related harm and doing everything possible to extend business as usual fossil fuel extraction for so long as it is economically and technologically possible. To deny the expansion of renewable energy access and to block access to measures that reduce consumption. To, overall, degrade the political will to respond effectively to a climate crisis that is directly linked to ongoing fossil fuel burning. And one potential political lever for this forced extension is advancing the fear of peak oil. For if people are wrongly led to believe that peak oil is a worse event than climate change, then it is unlikely people will make the changes necessary to transition away from fossil fuels. They, like the climate change deniers, will cling to fossil fuel extraction in the same way passengers unaware of the existence of life-rafts will cling to the upper tiers of a sinking ship. How does fear of peak oil work? It’s simple. First deny, degrade or ignore any potential value to human civilization for renewable energy sources (this is easy for oil industry folks, because they’ve had years of practice advancing anti-renewables misinformation). This includes using energy return on energy invested (EROEI) figures that are outdated or simply false. Second, declare an extreme supply-side ideology in which only fossil fuels have any practical means to fulfill supply needs. In this view, all farming relies on fossil fuels and cannot trade inputs or flexibly change how food is produced to help ensure resiliency (meat to veg, polyculture agriculture, edible landscaping, individually grown gardens, etc). So if fossil fuels peak, access to food is seen to peak as well. Third, over-emphasize the value of fossil fuels to all levels of civilization with the implied need for fossil fuel related industry to support civilization. This mind-set is in direct contradiction to the appeal first advanced by Limits to Growth authors for a transition to a sustainable civilization that did not rely on environment-polluting and resource-destroying energy sources as the basis for its prosperity. In fact, it directly obscures the need for such solutions by placing the notion that civilization is only sustainable so long as fossil fuels are available and that civilization inevitably dies without them. If society’s implicit goals are to exploit nature, enrich the elites, and ignore the long term, then society will develop technologies and markets that destroy the environment, widen the gap between rich and poor, and optimize for short-term gain. And it is reliance on fossil-fuel based technology that directly reinforces the vicious cycle that Meadows so eloquently describes above. The final element of the fear peak oil and cling to fossil fuels mind-set is to, at last, deny climate change and, more specifically, to deny that enough fossil fuels remain in the ground to set off climate change that is a threat to human civilization. And it is in this assertion, that they have excessively over-reached and are baldly incorrect (as many who keep tabs here are well aware). 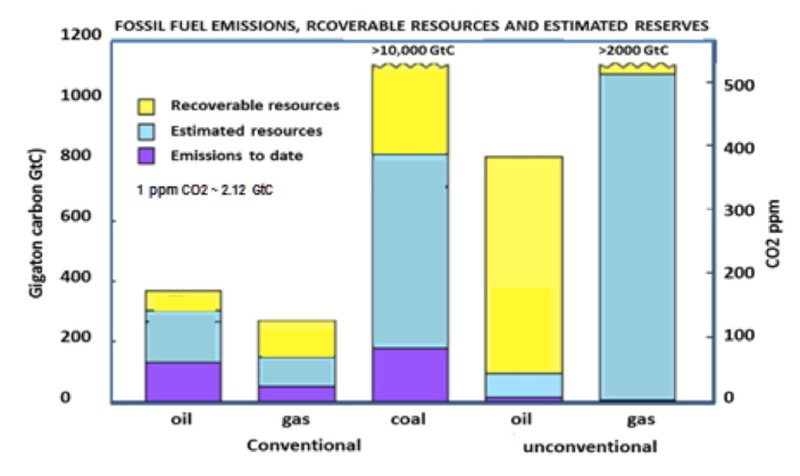 So with oil and fossil fuels demand now in trouble due to a broad political and grass-roots response, due to spreading measures that reduce fossil fuel consumption, and due to rapidly expanding ease of access to various renewable energy based technologies, a new Matthew Simmons – type view has emerged. The view is that Bakken and Eagle Ford are about to peak and with it, North American fossil fuel production will plateau or start falling and that a global peak is in the offing sometime around 2030. As with the Ghawar field focus, the view is likely correct in micro. The fields will probably peak by 2016-2020 and global oil production during the same period will (thankfully) suffer due to a combination of reluctance to invest on the part of oil companies, political constraints that hamper oil flows in Asia and the Middle East, and due to broader conservation measures and alternative energy adoption that begins to put the crimp on world oil demand. And how we respond to this potential crisis in world oil supply will have far-reaching impacts for both energy and climate going forward. If we see the peak as something we must avoid at all costs, what we will witness is the rapid expansion of fracking in foreign countries to include the exploitation of massive tight fuel resources in Russia and China. 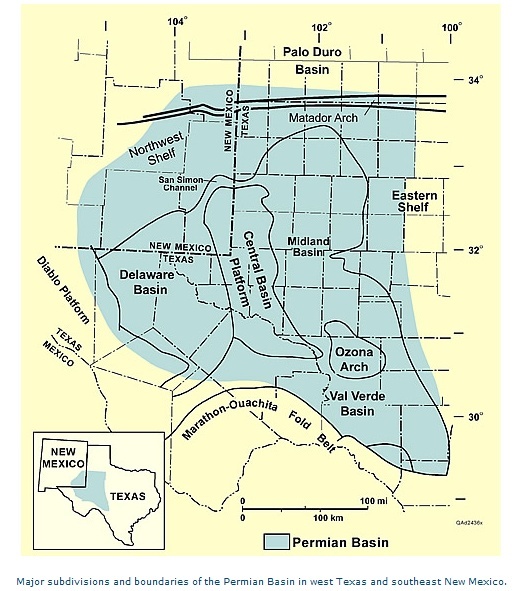 We will see the expansion of US oil production through enhanced extraction in the West Texas formation. We will see the barriers to tar sands extraction fall and Canadian tar sands oil rocket to 5 million barrels per day. We’ll see the China syngas operation horrifically expand to an environmental catastrophe to rival that of Canada’s tar sands. And we’ll see the first forays into gas hydrate extraction. We’ll see more coal plants converted to burn brown coal – a massive resource already exploited in conventional coal-poor regions. And we’ll see oil extraction extend into the climatologically violent Arctic. This expansion will not come without its severe costs. Fossil fuel prices will rise, poverty in many regions will expand. But without some major catastrophic event, net consumption, driven by an ever-expanding fossil fuel and related industry, will continue to increase over at least the next two decades and may well extend beyond 2030 as the massive unconventional resources continue to be tapped. For the political will for reducing such consumption will have been subsumed by fear of peak oil and the alternatives will, again, have been tamped down. Or, instead, we can embrace peak oil and stop trying to fight off what will inevitably occur over the course of decades or centuries. We can actively decide to change how much and what we consume and we can push hard for renewable energy and broad sustainability measures in agriculture. And through that action we might prevent a portion of the climate catastrophe we have already partly locked in. We can learn not to fear peak oil, but to pursue it, along with the will-full and socially chosen peaking of all fossil fuel sources. We can say goodbye to the age of burning and open a new age where we attempt to deal with the consequences of fossil fuel based industrialism before it’s too late. Before we no longer have the opportunity to. That’s our choice. 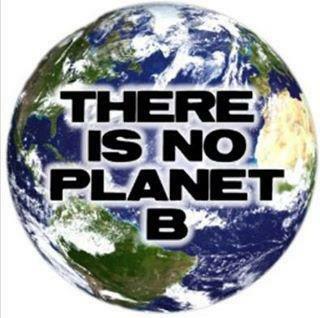 But going into it, don’t be comforted with false notions that we don’t have enough carbon sources to wreck the climate. And don’t, for goodness sake, embrace the notion that peak oil is the worst problem we face. Instead, it is a necessary problem. Part of the active and, admittedly, difficult act of changing how we live and of attempting to make human civilization both a more resilient and less harmful beast. How Many Barrels are in the Bakken? US meat, coffee, almond and milk prices to sky-rocket. Ukraine invaded by the Russian petro-state. Exxon Mobile to partner with Russian Rosneft and invest 500 billion dollars in extracting oil and gas from the increasingly ice-free Arctic. What has caused all this? In a term — Growth Shock. It’s what happens when any system grows outside of the boundaries of its sustainable limits. In the current, human case, its primary elements are overpopulation, renewable and nonrenewable resource depletion, climate change, poisoning the biosphere and wasting livable habitats, and a vicious system of inequality in which an amoral elite loots and pillages the lion’s share of planetary resources while driving increasing numbers of persons into poverty, hunger, and vulnerability to environmental/ecological collapse. In the more immediate sense, human burning of fossil fuels is now intensifying droughts and extreme weather around the world. This is negatively impacting agricultural production. In addition, military aggression on the part of Russia has destabilized one of the world’s largest food producers — Ukraine. But these causes and effects are all a part of the larger structure of an ongoing Growth Shock crisis. The most recent and more intense iteration of a series of events that began in the 1970s and continues today. In my own writing, I have described the forces of Growth Shock as four monsters (overpopulation, resource depletion, climate change, institutionalized human greed) and, like the Diakiaju of Pacific Rim, they continue to grow stronger and to devour increasingly large chunks of our world. In the context of our intensifying Growth Shock, conflicts can rapidly escalate as resources grow scarce and various nations, powerful individuals and corporate entities jockey for dominance in the context of increasing limitation and peril. But it is important to note that unless the underlying condition that caused the crisis — what is now likely the most terrible manifestation of Growth Shock ever witnessed by humans — is addressed, then there are no winners. No dominators that survive to flourish in the end. No remnant that sees a prosperous future. Only an ongoing string of worsening conflicts, disasters and temporary victories leading to a terrible and bitter ultimate defeat. So many of you are probably wondering why Russia suddenly invaded Ukraine? Why the West is taking an increasing stake in this country that, until recently, rarely showed on the international stage? The reasons currently given by US officials certainly appear noble. We should not allow one country to simply invade, bully and rig the electoral process for another. We should not allow a single nation to flaunt international law and behave in a manner that better fits an age of anarchy and brutality. We should not permit these things from the member of the international community with broad responsibilities and obligations that is Russia. These are moral and, indeed, appropriate frames for the current conflict. As they are appropriate rhetorical responses to international bullying. But we would also be wise not to ignore the underlying drivers — food crisis and overwhelming political power of fossil fuel special interests. At 2.2 trillion dollars in GDP each year, its economy is comparable to that of the UK — sizable, but not an equal to economic powerhouses US, China, Germany or Japan. But what the Russian petro-state lacks in economic girth, it more than compensates for in two very destructive and destabilizing items — nuclear weapons and fossil fuels. It also retains a rather sizable and effective military — one whose forces are capable of projecting power and toppling governments throughout both Europe and Asia. One that retains its ability to rain nuclear Armageddon on any nation of peoples around the globe. And this set of powers is increasingly being used to advance the special interests of the corporate, dictatorial state that is today’s Russia. But it is Russia’s vast oil and natural gas wealth, the single-minded and narrow interests of its rulers, and the dark impetus that is global climate change that have likely combined to spur Russian’s current aggression. For the very natural gas, oil and coal that Russia uses as a mainstay for its economy are now in the process of wrecking its future prospects and propelling it to ever more desperate and violent action. To understand why, one simply has to think a little bit about permafrost and frozen ground. A majority of Russia’s land mass sits on a pile of permafrost ranging from 1 to more than 10 meters in depth. In the past, this frozen substrata underlay many of Russia’s fields, cities and towns, forming a kind of frozen bedrock. But over the past few decades, the permafrost began to rapidly thaw under the radical and violent force that is human-caused warming. At first, this event was thought to weigh in Russia’s favor. The newly thawed permafrost would become more productive farmland, many assumed, and the added warmth would extend Russia’s growing season. But few apparently accounted for the speed and violence of human-caused climate change. What happened instead was literally a firestorm. For the thawing peat retained a combustibility roughly equivalent to brown coal. Even worse, it contained pockets of highly flammable liquified organic carbon and methane. Over top this volatile layer were the great boreal forests and the vast grasslands of the Russian land mass. During the periods of summer drought that emerged as human caused climate change amplified at the end of the 2000s, these forests and grasses were, increasingly, simply piles of kindling growing atop a meters thick layer of volatile fuel. By 2010, climate change brought on a series of record droughts and heatwaves extending far into the Arctic that set both permafrost thaw and lower latitude regions ablaze. As a result, Russia suffered agricultural losses unlike anything seen in its past. Fields and towns burned. The productive regions burned. Russia was forced to close its agricultural market for exports. World food prices hit all time record highs and the food riots that followed were enough to topple regimes and alight civil wars throughout the world’s most vulnerable states. 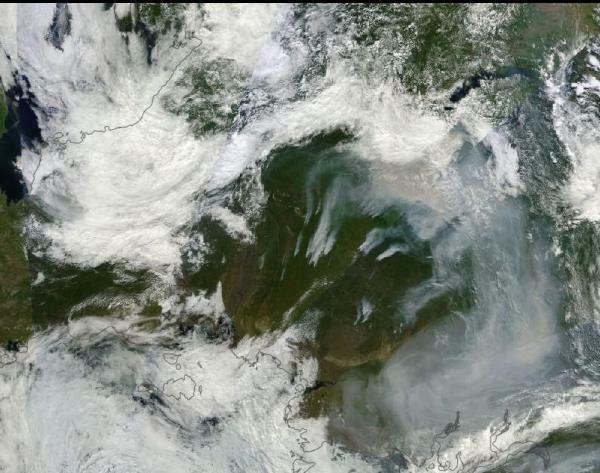 Through the summers of 2013, Russia suffered amazing fires in its thawing tundra lands. These blazes were, at times, intense enough to require the calling up of its military and the mobilization of up to 200,000 people simply to fight the fires. Heat and moisture from the thawing tundra spilled out into the Jet Stream and amplified the storm track. By 2013, record drying and burning in the tundra lands turned to record floods in the Amur region of both China and Russia. A tragic song of flood and fire. It was a string of climate change induced disasters that produced blow after telling blow to Russian agricultural production. Meanwhile, around the world, similar droughts, floods and severe wind storms were ripping through the world’s croplands. By early 2014, the world food price index was again on the rise. By February, the index had climbed to 208, a very high level that would put those countries and populations at the margins at risk of increasing poverty and hunger all while potentially destabilizing any number of nations. Perhaps the irony is lost on Russia that the very fuels — oil, gas and coal — that it views as an economic strength are also the source of its increasingly marginal food security and the ongoing and growing devastation of its lands. But Russia, its strongman, and its corporate oligarchs likely haven’t overlooked the fact that Ukraine is one of the world’s largest food producers. In a world where food is becoming increasingly costly and scarce, this particular commodity may well be more important than even oil, gas, or coal. Ukraine possesses 30% of the world’s remaining richest black soil. It regularly ranks within the top ten producers of both wheat and corn. It is the world’s top producer of sunflower oil. The reach of its agricultural exports extends to the UK, Europe, Japan, China and into Russia itself. If Russia has a food crisis, it will be to the Ukraine that it turns to first. Moreover, the current Russian dictator must see an imperative not to rely overmuch on the US or its other economic rivals for food. So it is in this context — a one in which climate change is causing Russia to flood and burn, in which climate change is now beginning to take down global agricultural productivity, and in which the Ukraine could well be seen as the Iraq of world food production (one of the only countries with the ability to radically increase production) — that we must also view both the Ukrainian revolution for independence and the Russian armed invasion as a response. Centuries ago, during the dark ages, bad winters drove waves of tribes out of the frigid northern lands and into the then fertile fields of Rome and Europe. History, it seems, is not without its rhymes. For now, a fiery human-driven thaw and climate change appears to be having a similar impact on the Russia and Ukraine of today. For the lands already under Russian occupation and threat of invasion (Eastern Ukraine primarily) are also some of Ukraine’s most productive wheat and corn growing zones. These lands under threat of additional Russian incursion, if added to the already occupied and planned to be annexed Crimea would compose the bulk of Ukraine’s agriculture. Russia’s invasion, thus, must be seen as a direct looting of Ukraine’s lands and productive capacity for Russian and, by extension, Putin’s self interest. A set of interests likely inflamed by Russia’s own declining state of food security. Unfortunately, this conflict, like so many others, falls under the ominous shadow of the global fossil fuel trade. A shadow that grows ever darker as the crises imposed by human-caused climate change become more and more dire. In the context of what could cynically be termed American interests, the fossil fuel giant Exxon recently partnered with Rosneft, an oil corporation Putin and his oligarchs essentially looted from a political rival, to invest 500 billion dollars in drilling and exploration in the Russian Arctic. 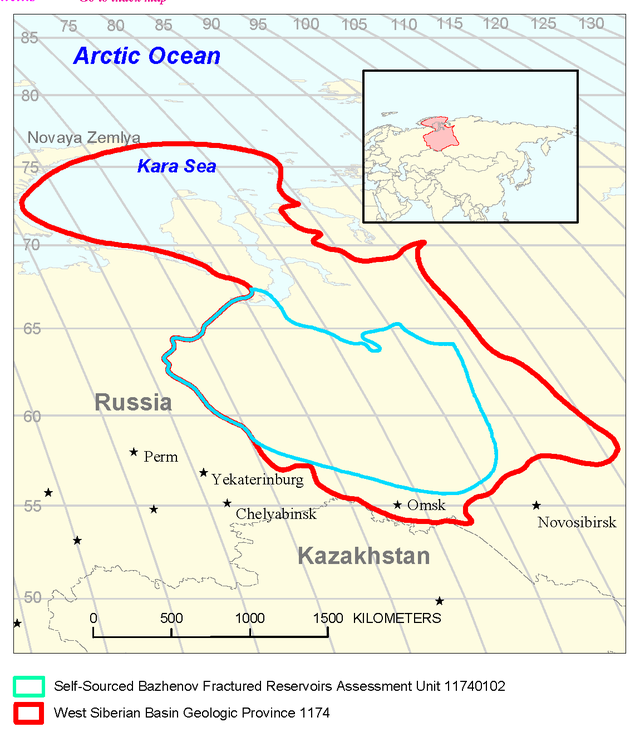 The zones included in the deal involve the highly unstable clathrate and natural gas stores of the Arctic Ocean. And considering the massive sum invested, one cannot overlook the likelihood that the ESAS’s store of up to 1400 gigatons of natural gas clathrate have now been targeted by global fossil fuel interests for burning. Such an exploitation would result in the near tripling of the current human atmospheric carbon loading — all by itself and without the added inputs from coal, tar sands, or other oil and gas reserves. In other words — corporate insanity in the mad pursuit of profits for a few supremely wealthy and powerful individuals. In this case, a breed of greed-driven insanity that falls under the specter of an increasingly violent and expansionist Russia. One driven to hunger for resources by the land and crops destroying influences of the fossil fuels it continues to seek to exploit. Here is Growth Shock in its most brazen form when wealthy oligarchs, dictators and corporations collude to profit while ruining the productivity of the lands upon which even they rely. And it is this terrible state that cannot be allowed to continue. The US, therefore, could strike a blow against both Russian aggression and climate change game over by sanctioning Russian-backed Rosneft, disallowing any American corporation from conducting business with them or any other Russian petroleum entity and going further to say that they will sanction any other global corporation with ties to Rosneft. Use of the power of the dollar and of the global monetary system, in this way, could strike a blow against both the greed that underlies the current Growth Shock crisis and against the maniacal continued and expanding exploitation of extraordinarily destructive fuels. If the US wishes to continue to bring Russia to heel, it will also use the carrot of access to US grain and food shipments as well as providing partnership arrangements with US alternative energy and sustainability-based corporations in exchange for a peaceful withdrawal from the Ukraine. To help Russia save face, it could provide these offers in a less public fashion or in a way that is not personally insulting to Putin. In broader context, the deteriorating global food situation, the deteriorating global climate situation and the maniacal quest by fossil fuel companies to access and burn an ever-growing volume of oil, coal and natural gas has reached a critical stage that simply cannot continue for much longer without entirely ruining the prospects for human civilization and, likely, much of life on Earth. The Russia and Ukraine conflict is an opportunity to begin a full attempt to change course and to bring the, now very large and growing, forces of our Growth Shock crisis to bay. If we do not, the window of opportunity may well be closed and we may well have consigned ourselves to ever-worsening conflict under a situation of ongoing resource destruction, destruction of modern civilization’s food base, a situation where the powerful are ever more enabled to take from the weak, and a situation in which a hothouse extinction eventually snuffs out most or all of those that survive the ensuing collapse. A Song of Flood and Fire. Some of you may have noted my absence. I’ve been nose-deep in completing the launch of a book that has been about 10 years in the making: Growth Shock. It developed both from my experience as an emerging threats expert for Jane’s Information Group and related consulting efforts, later from my connection to thousands of wonderful young people, many of them disadvantaged, through a 6 six year schools campaign, and finally through participation in the direct actions that were Occupy Wall Street and the 2012 Stop the Pipeline demonstration sponsored by 350.org in Washington, DC. 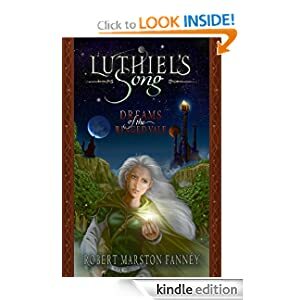 In support of these efforts, at least 60% of the book’s proceeds will go to 350.org (40%) and to direct funding for freedom from fossil fuels (FEFF) for individuals, localities and communities (20%). But I’m not stopping with these actions. 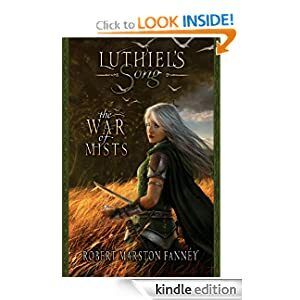 An upcoming third speculative fiction novel in the Luthiel’s Song series will be re-named The Death of Winter and I will be organizing a campaign to raise energy transition funds for public schools around the sales campaign for this book (more on this later). Another publication effort examining the loss of glacial and sea ice and its consequences will direct funds to scientific research through the Dark Snow Project and to help support James Hansen’s continued work at Columbia University. A fourth and still unnamed publication will also be directed toward reinvigorating policy efforts to rationally and benevolently restrain human population with an ultimate goal to bringing it, along with consumption, back into balance with Earth Systems and to back out of our current and dangerous overshoot. These efforts will likely take years to complete. But they are now on the table. This is not at all to denigrate the need for direct action, campaigning, and demonstration. When possible, I will continue to participate in these efforts. But my goal will be to organize my life and my means of life support to also support systems that re-invigorate, restore, renew, and enlighten. This is the basis for the kindness economics proposed in Growth Shock — that our life works re-weave humankind back into the web of life, that we stop breaking it, and that we develop human technologies and thought systems that support life, rather than harm it. But we’re a long, long way from any of that. And, at this very late hour, some of us are only just beginning to respond as others still languish or remain trapped, captives to systems of harmful consumption and harmful action. Meanwhile, climate change, overpopulation, resource depletion and the institutionalized and greed re-inforced systems that lock the technologies, policies, cultures and thought-systems that cause such harm in place are now in a critical phase of crisis, a phase where harm from these four forces is ramping ever higher, causing great fractures through the structures of modern civilization. Like the metaphorical lemmings, we still run headlong toward the precipice. Sooner or later, we will go over. Unless we stop. Unless we back away. We haven’t done this yet. We haven’t even slowed down. And, for this reason, we are in deep, deep trouble. I have a confession to make. One that is not easy to vocalize. One that is equally difficult to listen to. My confession is not one of a personal nature. I am not revealing my own, petty, individual sins. Instead, I’m making a confession for us all. A revelation of the ongoing and maturing tragedy of our race. One we will each need to be made aware of soon if we are to effectively act. For the age of excess is rapidly coming to a close and we are now entering a difficult and hard to manage age of consequences. My confession is simply this: we are in trouble. A kind of trouble that is both typical to all living creatures and beyond the scope of anything we humans have yet witnessed. A kind of trouble that is both born of the natural world and directly caused by us. Our trouble is that over the course of the next century we will run head-long into a number of very difficult to manage shocks that are the result of our unsustainable growth. How we confront these shocks will determine whether or not human civilization survives to reach the 22nd, 23rd, or 24th centuries or whether we, at the very least, encounter a coming age of darkness and decline. That we will encounter some trouble is now unavoidable. At this point, all we can do is seek to reduce the scale of that trouble and lessen the harm that is its inevitable result. A decade or two ago, if we had acted sooner and with due urgency, we might have prevented harm. But harm is already upon us, growing worse with each passing year. And though our trouble has already become apparent to many, we still languish, squandering the time and effort needed to manage the emerging shocks even as they grow more deadly and dangerous. If we decide to confront these troubles, what lies before us are many decades or more of sustained effort to reduce the damage we have inflicted upon ourselves — efforts from which may arise a new golden age should we overcome these troubles. For pushing beyond our current limits through renewable energy systems, providing direct supports to heal the living world we depend on, establishing more kind and inclusive economic systems, and undergoing the general transition to sustainability necessary to deal with our current crisis results in an ever-expanding justice and prosperity. The potential for a true world without end. If we do not act, a massive and rapid decline of human civilizations, a mass extinction in the oceans and on land, and a radical re-shaping of the Earth’s environment to a state far more hostile to humankind are all in the offing. This is my confession. For it is the truth or our age. It is our dire tragedy, and our great hope. For we are living in the age of Growth Shock. Climate change, a topic that once was the purview of scientists and academics, has now become a central issue in today’s political and social discussion. The primary reason for this shift is the emergence of increasingly abnormal, damaging, and severe weather events that have come with greater and greater frequency to plague the world’s cities, states and nations. Tornadoes have devoured entire towns, hurricanes have become more numerous and powerful, freak hybrid superstorms are now a serious risk, 100 year flood events have become commonplace, wildfires are now endemic, causing damage in the billions of dollars annually, and immense country-spanning droughts now range the globe. A secondary reason for our growing awareness is that it is becoming obvious that the world’s ice sheets are in rapid retreat even as sea levels are on the rise. Nine out of ten glaciers are in decline. The great ice sheets of Antarctica and Greenland lose hundreds of cubic miles of ice annually. The resultant sea level rise driven by this melt and by thermal expansion of the oceans puts entire cities, states and nations into existential crisis. By the end of this century, practically all of south Florida may be little more than a shrinking archipelago. Some Pacific island nations are planning their inevitable evacuation to places like Australia, New Zealand, or the continents. Almost all coastal cities will be forced to expend significant monies and resources over the next century if they are to have any hope of warding off the rising seas and more powerful storms. An effort that, in the end, may well prove in vain. It is a slow motion disaster movie script that plays before our eyes now, almost weekly, on the evening news. And there are many, many events that the mainstream media does not cover, likely due to the fact that it has become saturated with stories of this kind. Unfortunately this rising climate change emergency is just one aspect of a larger crisis of civilization-wide Growth Shock. Growth Shock is a dangerous condition brought on by a combination of our inexorably expanding global population, our over consumption of renewable and non-renewable resources, and the damage to our environment via carbon pollution that results in climate change. These three forces are all enabled by a great human limiter — Greed — which has been institutionalized in so many of the world’s corporations and is deeply imbedded both explicitly and implicitly in the world’s political systems and ideologies. So to solve climate change, we will also have to do much better at solving the problems of overpopulation, dangerous and violent methods of resource consumption, and the underlying disease of human greed. 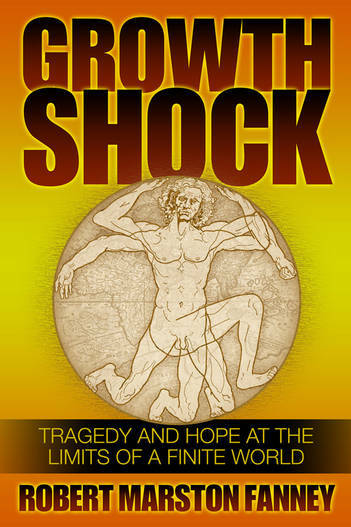 I have also just completed my own work on the issue entitled Growth Shock: Tragedy and Hope at the Limits of a Finite World which will see electronic publication within the next two weeks. The roll-out for this work will proceed over the next two weeks and it will be managed in such a way as to responsibly redistribute proceeds to charitable causes that, in my view, have been most effective in working to reduce the harm caused by Growth Shock and the related climate emergency (more on this later). In any case, as climate change is one of the four forces enabling Growth Shock, we have come to a time where we are compelled to make choices and act in ways that prevent further harm through mitigation, to attempt to adapt to the growing nightmare that is now upon us, or to make the choice to fail to act and therefore increase the degree and velocity of harm coming down the pipe. The obvious and worsening climate emergency that we are now just starting to experience has galvanized a growing cadre of grass roots organizations and individuals dedicated to the cause of preventing as much of the coming damage as possible. These advocates of mitigation believe that strong action now has the greatest chance of reducing future harm. And their efforts and advocacy are based in the sciences. With extreme weather and damaging events ramping up at 400 ppm CO2, the situation is bound to be far worse at 450, 550, 700, or the 900 ppm CO2 predicted under business as usual by the end of this century. Mitigation advocates are clear in the understanding that the less CO2 and other greenhouse gasses we emit, the less dangerous the ultimate crisis will become. Mitigation and preventing future harm, therefore, must rely on a combination of efforts. Rapidly increasing renewable energy development will be needed to replace a large enough portion of fossil fuel use to sustain life support systems for the planet’s 7 billion human beings. This will involve a politically difficult replacement of fossil energy sources with clean sources like wind and solar as well as the regulation and eventual elimination of carbon emissions altogether. A more efficient use of space and, over all, more efficient life styles will also do much to prevent damage through both reducing energy and materials consumption. Such a transition will be difficult under current economies that are designed to endlessly increase the consumption of materials, labor, and resources all while funneling wealth to the top of social systems. These social and economic structures dangerously enhance the level of damage we cause and so must be challenged and called into question if we are to make much head-way. To this point, a large shift away from the massive agribusiness of meat farming may well be needed. Today, more than 65 billion livestock are estimated to be held in states of captivity far more brutal and intolerable than even the worst-treated of human criminals. The lifespans of most of these creatures is doomed to a tortuously short 1-4 years and the unspeakable suffering many experience during their times as livestock animals is a black scar of atrocity born by our race. An estimated 40% of the world’s grain crop goes to supporting this terrible and inhumane manifestation of food industry. Further, the lion’s share of the 30% of human greenhouse gas emissions attributed to human agriculture is based in the meat industry. As such, our industry enhanced dependence on harming animals for food and materials is likely to have to be greatly abated as part of a comprehensive climate change mitigation action. In any case, the amoral practices required by industry to produce such high volumes of meat render it ethically as well as physically unsustainable. A true comprehensive mitigation will also have to redefine current paradigms of growth and wealth generation. Economic systems will have to become less focused on short term gains and concentrating wealth at the top and more focused on long-term prosperity and survivability through a more equal sharing of and access to more limited resources. The exploitative paradigm of pure capitalism has failed and failed again. This is largely due to the fact that pure capitalism tends to demand all responsibility be placed on the less fortunate and successful masses as the more fortunate are enabled to behave as little more than privileged anarchists. To mitigate the social shocks that are inevitable during a climate crisis and to reign in the massive, excessive and abusive over-use of resources by the wealthy, more responsibility must be demanded from the most privileged members of societies. Wealth compression, therefore, is an effective tool in reducing the harm caused by an over-consumption of resources at the upper rungs of civilization where some members consume more than 100,000 times the resources of a subsistence farmer and about 3,000 times the resources of a person living in today’s middle class. Since the levels of exploitation and consumption that have enabled climate change to run rampant are encouraged and required by today’s neo-liberal and globalized brand of capitalism, this manifestation of capitalism must be reigned in, caged and defanged if we are to have much hope of mitigating the larger crisis of climate change. Since we missed our chance to mitigate much of the damage from climate change by about 30 years (we’d have been much better off if we began rapid CO2 reductions, sustainability and wealth compression efforts in the 70s and 80s), a massive effort to adapt to the changes now set in motion will probably be necessary. It is likely that we’ve already locked in many decades of increasingly severe weather, and, likely, centuries of rising seas. Ultimate sea level rise based on the current level of CO2 in the atmosphere will probably terminate at between 15 and 75 feet higher than the current day (rising at between 5 and 15 feet per century). These changes are probably locked in now even if we halt all CO2 emissions today. But, more likely, our best realistic hope is probably to stabilize atmospheric CO2 levels at around 450 parts per million, which would result in higher-end damages being locked in for centuries. As a result, if we are to continue to have powerful, resilient civilizations at the global and continental levels, then we must do serious work to make those civilizations more resilient. Entire cities may have to be moved or surrounded by increasingly tall flood barriers. New port systems will have to be devised to cope with changing sea levels. Architects and engineers will have to alter building and structure design to deal with more vicious storms and weather conditions. Farming will have to become more adaptive. The world’s agricultural systems will have to do more with less. Most likely, humans will have to rely more on grains, fruits, vegetables and nuts (which are more efficient ways to transfer energy and nutrients to the human body) and far less on meat (also a mitigation as described above). We may need to expend resources to ensure that our fellow living creatures, which provide essential life support services, do not become extinct. In short, what damage we cannot prevent via mitigation, we will have to learn to adapt to. As such, human civilization will probably need to take more responsibility in both defending itself and the natural world from the harm that is now coming. With carbon pollution already reaching dangerous and excessive levels, any choices that do not mitigate (prevent) or help adapt to future climate change result in an increasing degree and velocity of harm. These choices include climate change denial — which not only insanely disputes the basic physical science behind the effect of greenhouse gasses on Earth’s climate but also ignorantly attributes current increasingly severe weather, temperature and sea level rise to a scientific ‘natural variability’ that denial proponents, purposefully or through blatant stupidity, misrepresent and misunderstand. This is not to confuse those who are understandably scared by the force that is climate change and have succumbed to the natural, though in this case irrational, human response to withdraw from and avoid danger. Political climate change denial seeks to exploit this natural human response for short term political and economic gain and, as such, must be viewed as anathema. Human denial and avoidance of harm, however, is a basic instinct-driven response that must be rationally addressed. In the case of harm caused by climate change, the only rational way to avoid it is through mitigation and adaptation. Denial of the physical forces of the universe unleashed by human over-consumption and institutionalized greed, on the other hand, is little more than a withdrawal into the realm of wishful thinking. Denial, in both cases, causes inaction and paralysis, enables the continuation of business as usual, and, therefore, increases harm. To this point, any efforts to slow down or reduce mitigation efforts also increases the velocity and force of the harm now rushing toward us. Pressures to slowly mitigate and gradually adapt may seem rational at first, but result in a less tenable future long term. Responses need to be measured, organized and swift — like the emergency procession to lifeboats aboard a sinking ship. Irrationally clinging to damaging systems for as long as possible amounts to playing fiddle on the deck as the critical time to find a place aboard a lifeboat trickles away. If there is even a small chance that mitigation and adaptation will bring us through the crisis, then shouldn’t we pursue all efforts and make that likelihood as great as possible? What if the British and the French had simply given up in the face of what, to them, must have seemed an invincible German military juggernaut during the early days of World War II (in fact, their early denial that a problem existed at all set up the conditions for this terrible war in the first place)? To the doomers I would say that the more we fail to respond, the worse the crisis becomes. And a crisis always seems most insurmountable at its start and just before creative response is initiated. Though it is true that many civilizations have failed in the past when confronted with problems that are similar to ours and that climate change, especially, tends to crush civilizations by creating problems that are outside of its ability to evolve and adapt, failure to respond almost always ensures collapse. We may argue now that response is too little too late, but we really won’t know unless we’ve expended all efforts. And so all efforts are, therefore, entirely moral and appropriate. Lastly, a number of entrenched special interests are heavily invested in harm. These include the world’s fossil fuel companies, the industrial meat industries, a number of investment banking firms that support and profit from such activities via financing, and a large supply chain of industries that produce products based on these activities. Since the resources and profits of these industries are, in part, shared with broader society via the stock market and through the production of cheap, easy to access, goods and services, many states, cities and individuals are also, wittingly or unwittingly invested in harm. As such, a turning away from harm will require conscious choices on the part of individuals, cities, states and industries to not only divest in stock portfolios that profit from harm but also to actively change behavior, methods of consumption and materials use. As we begin this process, entrenched industries and individuals that profit from harmful and exploitative activities are likely to dig in and fight every step of the way. They will attempt to deny us product choices via legislation and market dominance even as they attempt to pretend that harm coming from their practices is both natural and inevitable (directly or indirectly enhancing denialism and doomerism). This institutionalized, irrational and entrenched manifestation of human greed represents the center of gravity of harm coming from human systems and, if we can address it, it is likely that both denial and doomerism will fade. In the end, any action that delays or prevents a swift, encompassing, and organized response to climate change increases the level of harm that we are in for. Such a choice, whether conscious or not, is essentially amoral in that it reduces civilization’s chance to survive an emerging existential crisis. A choice that eventually results in an escalating level of damage and loss of lives and livelihoods. 1. To prevent and mitigate harm. 2. To do our best to adapt to the harm that is coming. 3. Or to increase the degree and velocity of harm by failing to act. My best hopes are for your courage to make the just choices for the sake of you, your family, and for all of us. This is our responsibility to ourselves and each other. And the time to act is now, now, NOW. According to a recent report from the International Energy Agency (IEA), world CO2 emissions hit an all-time high last year at 31.6 gigatons. This means that only a 532 gigaton cushion now remains between pushing the world above the dangerous 2 degree Celsius Equilibrium Climate Sensitivity threshold. At the current rate of emissions, we will run headlong into this threshold within a little more than 16 years. So before 2029, without major changes in the world’s energy structure, a civilization-endangering global warming of at least 2 degrees Celsius will be locked in. In order to attempt to buy time to respond to this growing crisis, the International Energy Agency has published a policy paper containing recommendations for a path forward that is less damaging than the current one. The agency paper noted that the current emission path brings us to 3.6 to 5.3 degrees warming by the end of this century under Equilibrium Climate Sensitivity (Which measures about half of long-term warming). This pace of emissions is well above that needed to reach the safer goal of 2 degrees Celsius equilibrium warming or less by the end of this century. A level that climate scientists say human civilizations are better able to adapt to. Pace of emissions increase did, however, back off from 2011’s rapid growth, slowing to 1.4 percent. IEA noted that US switching from coal to natural gas and a Chinese energy policy that included greater focus on renewables were major contributors to this slower pace of emissions growth. US emissions fell by a total of 200 megatons, reaching a level last seen in the 1990s. Europe also saw significant reductions — cutting emissions by 50 megatons. Unfortunately, despite a stronger renewables policy, the Chinese still emitted 300 megatons more carbon than in the previous year, while Japanese carbon emissions also advanced by a total of 70 megatons. The loss of ground in Japan was primarily due to its switching away from nuclear power as a primary energy source and returning to more traditional fossil fuels — natural gas and coal. The hiatus in US carbon emissions may also be somewhat temporary. Natural gas prices are rising and, traditionally, this has resulted in a whip-lash effect driving utilities back to coal generation. It is worth noting, however, that wind energy is now competitive with coal power, while long-term coal prices are increasing. Solar energy prices are also falling rapidly. So let us hope that the natural gas whip-lash effect is somewhat muted by more adoption of renewable energy sources. Despite a greater overall adoption of renewables and lower carbon energy sources, CO2 dumping into the atmosphere is still tracking along the worst case scenario for climate change projected by the IPCC. In order to meet this challenge of rising emissions, IEA urges a number of policy changes to be put in place immediately. This IEA report can be viewed as a plea to slow the damage even as it provides a compromise plan that could be put in place. The plan is both modest and ambitious. Modest, because the initial changes are easy to incorporate into the current energy structure. Ambitious because long-term goals involve a phase-out of the use of fossil fuel assets. This call for comprehensive policy-based fossil fuel stranding and phase-out is the first of its kind from a major world policy body. In total, about 5-6 percent of undeveloped oil and gas reserves are projected not to be used. Also implicit in the the report is a stranding of a large portion of the world’s coal reserves as a larger transition to renewable energy is constructed through 2035. The IEA recommends that oil, gas and coal companies can shift to carbon capture and storage if they wish to protect their assets. In the end, though, the numbers provided by the IEA will require more clarity in order to add up. More than 2,800 gigatons of fossil fuel are on the books of the world’s fossil fuel companies and none of those assets are yet slated to be captured in order to prevent atmospheric release. Even worse, millions of tons of carbon are released into the atmosphere every year via the process of oil and natural gas extraction. These emissions are not listed as assets, but they still end up in the atmosphere. Cutting them in half, as the IEA recommends, will still leave half of this addition active. The IEA’s recommended plan would, at best, keep world carbon emissions about stable through 2020. The result would be that 256 gigatons of carbon will be emitted by 2020 through fossil fuel burning, putting us about half-way on the path to 2 degrees Celsius (equilibrium warming) by that time. Such a plan would leave the world with only about 276 gigatons of carbon wiggle room, requiring a very rapid draw-down of carbon emissions post 2020. That said, starting implementation now would reduce the costs of a long-term transition away from fossil fuels by $3.5 trillion dollars, according to IEA estimates. So beginning changes now would lay the ground-work for a smoother, more rapid transition post 2020. Also, failure to implement these policies through 2020 puts the world on a path for 2 degree Celsius warming to be locked in sometime around 2025. So it is doubtful the goal of preventing a 2 degree Celsius warming (equilibrium) could be achieved without taking on the modest policy changes recommended by the IEA now. For these reasons, the IEA plan should be both applauded and looked at with caution. Applauded, because it begins to put in place the necessary framework for long-term emissions reductions world-wide. Applauded, because it barely keeps alive the goal of meeting a less than 2 degree (equilibrium) temperature increase by the end of this century. And looked at with caution because it sails very close to a dangerous climate change wind. For more comfort, we should ask for a more ambitious set of policies. But given a major dearth of such, the IEA measures are among the most prudent yet advanced. Not really much cause for comfort during this late hour. Is Coal Just One Enormous Malinvestment? This world hosts 50,000 coal plants. China alone boasts more than 650 gigawatts worth of coal electricity capacity. And, if recent reports bear out, countries around the globe still plan to construct 1,700 more. Coal is the world’s dirtiest form of energy. It is also the world’s greatest contributor to global warming, water pollution, lead and mercury poisoning. So what happens when, as climate scientists now predict, the weather and environmental impacts of human caused climate change rapidly ramp up over the next few decades? What happens to all the hundreds of billions of dollars invested in coal energy sources and in the new projects now planned? For all practical purposes, coal doesn’t have much life left to it. Civilizations can’t continue to use coal as a viable energy source for much longer. All over the world, massive political and environmental movements stand against coal, pushing for the closure of plants, the leaving of dirty coal in the ground. And the movement can only grow. Soon, entire nations will be displaced by global warming. Soon, Greenland will begin a dangerous death spiral of increasingly rapid melt. Once the impacts of climate change grow to harm ever greater numbers of people, the political impetus to stop using coal will rise in a vast backlash against an energy source that caused so much harm, that would cause worse harm if its use continues. And so, what does this make coal to the people who currently own it? One enormous liability. A dead albatross hung around the necks of the world’s energy investors. That the pain to these investors will be great is a given. But how much worse will it be if massive investments in coal continue? How much more good money will be spent chasing this bad end, further shifting these investors and their capital out onto an already unsteady branch? When I talk about investors, to a certain degree I’m talking about all of us. World bank loans funded through the international banking system still go to support new coal plants. Tax monies in various countries go to a wide range of projects that either artificially cheapen the cost of coal or directly fund new power plants. Civilizations have engaged in a massive long-term commitment to coal. But with climate change rapidly rising into an ongoing crisis and with new, alternative forms of energy becoming ever more competitive, the old policies that encouraged coal exploitation are now untenable. They are nothing short of a massive malinvestment. A combined climate and energy bubble that will, over the coming years, burst in a way that will be quite painful to the world’s markets. Sunk costs in these systems will not be recuperated and ongoing profits from such sources will be cut short. We can reduce the pain of coal’s imminent collapse now. We can stop investing in a dead man walking energy source now. And we can shift to the alternatives that represent a real energy future for our civilizations. Or, as with the financial crisis, we can continue to unwisely spend our money. To take risks on investments that we know are almost certain to fail in a mad pursuit of very ephemeral gains. For my part, I know where my money would be. It would be on the energy sources of the future — wind, solar, and vehicle to grid. Not dirty, dangerous, and depleting coal. A deadly and devastating storm, one that set records not seen in 300 years, dealt a terrible blow to New York’s coastal regions Monday. The 940 millibar storm, the most intense for this region on record, pulled a 14 foot storm surge up Long Island Sound and into Naragansett Bay Monday evening. This intense pulse of water overwhelmed New York’s flood defenses, filling the great city’s subways, overwhelming the Battery area, and soaking New York City neighborhoods. Construction at the new World Trade Center site was inundated, underground subways; parking lots and shopping centers were flooded out. 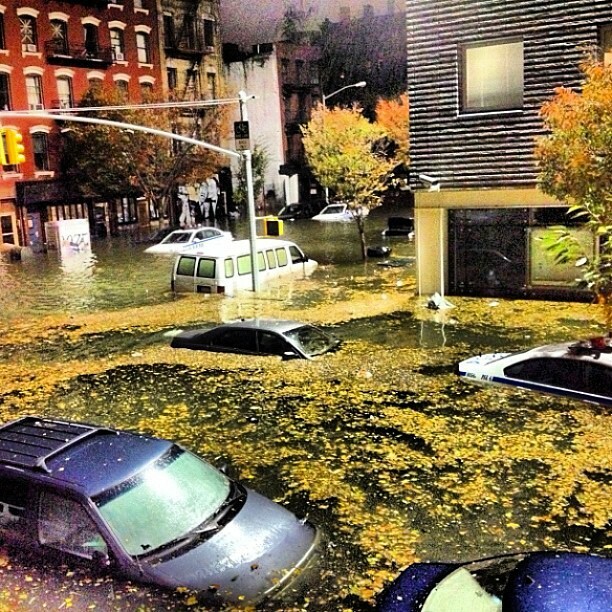 Massive surges of water assaulted the US’s largest city from all sides. Naragansett, to the north spilled water into the city’s back side. Long Island Sound, to the south, funneled an amplifying pulse of water directly into the city’s heart. The massive storm surge rushed in through storm drains, sending water gushing up through sewers, fountaining out of man hole covers, until neighborhood after neighborhood looked out over flooded streets. Above the city, the storm left the twisted wreckage of a crane dangling from a high rise apartment complex built for the affluent. Billionaires, who occupied the top four floors of the complex, were treated to a front row view of the wreckage — twisting and swaying in Sandy’s 90 mph winds. Transformer fires and electrical equipment explosions whelmed the night before leaving much of the city dark late Monday. Large sections of the city remained without power as first responders began to pick over the damage this morning. Though New York City was assaulted by a host of troubles, much of Long Island and coastal New York also fell under the heavy blow of this monster storm. Storm surges left section after section of the coast assaulted by battering waves. In places, the dune lines or sea walls were breached, leaving communities vulnerable to the ravages of an angry sea. Sandy’s fury inundated Breezy Point. The force of the storm was enough to flood first floors and foundations, ripping off debris and sloshing it together in a twisted, shambling mound of wreckage at the mercy of an angry tide. But the worst came in the form of an unexpected fire that leapt from house to house even as the flood waters swirled about. Fire fighters dragged hoses through the heaving water or piled into inflatable boats in a desperate attempt to combat the spreading inferno. NYPD personnel took to the water in scuba equipment to reach victims trapped in flooded, burning homes. As the water began to trickle out, homes burned to their foundations. In all, the fire claimed about a hundred structures. 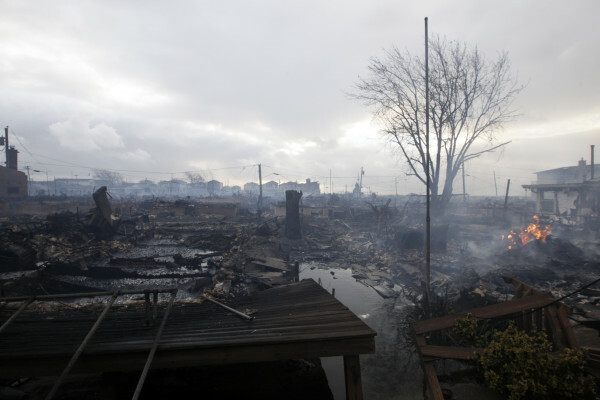 By sunrise, all that remained of a large swath of town was a pile of wet and smoldering debris. A scene that might remind one of last year’s Japan Tsunami or of Dante’s Inferno, depending on predilection. 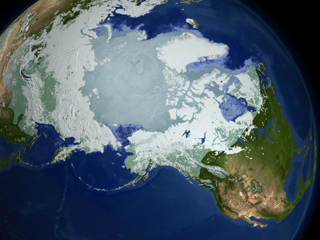 A recent paper in Nature Geoscience has shown that human caused warming could pump enough methane out of the Arctic tundra to raise the Earth’s temperature by between .4 and 1.5 degrees Fahrenheit. The paper, entitled Significant contribution to climate warming from the permafrost carbon feedback, showed that between 6 and 44 percent of all permafrost carbon could be emitted by 2100. Since there’s more carbon in the permafrost than what has been historically emitted via fossil fuels, this number is large and very significant. The result of such an emission, even on the lower end, would be a significant contribution from nature to an already difficult to deal with man-made warming. Research indicated that carbon emissions would be equal to between 40 and 100 additional parts per million CO2. However, a substantial portion of this increase would, initially, be methane, which, as a greenhouse gas, is 25 to 70 times stronger than CO2. This would seem to indicate that the researchers’ initial estimates of warming potential from permafrost carbon emission is low. And the researchers, themselves, admit their first estimates are conservative. Perhaps, the most ominous outlook in the study is that it found that the amount of greenhouse gases to be emitted from permafrost over the next century largely cancel out carbon absorption by the oceans. Furthermore, the study did not take into account carbon emissions coming from methane hydrates in the ocean or from carbon sources in Antarctica once significant areas of that continent begin to thaw. What this means is that, even were CO2 emissions to cease this decade, CO2 levels will likely remain above 400 ppm for as much as three hundred years. And this extended duration of high CO2 has substantial repercussions when it comes to the future shape of the world’s ice sheets and future ocean levels. Skuce is somewhat euphemistic and unclear in his assessment. I will not mince words. We are on track to a hotter world if we stop fossil fuel emissions now. Things are even hotter if we cut back fuel emissions soon. Continued fossil fuel emissions, without reductions, however, puts us on a short path to 1000 ppm CO2 by the end of this century. And that path is a short, hot road to hell. Natural disasters spurred by human-induced climate change are ravaging the globe. Wildfires raged in the US, Russia, and Spain. Massive Floods took the lives of scores and left millions homeless in India and Bangladesh. In North Korea, a 100 year drought is worsening a decades-long hunger crisis. And, again in the US, a thunderstorm packing more than five times the energy of a normal summer rumbler formed over Chicago before ripping a 300 mile wide swath of destruction to the Atlantic Ocean, leaving 22 dead and millions without power amidst one of the worst heatwaves on record. 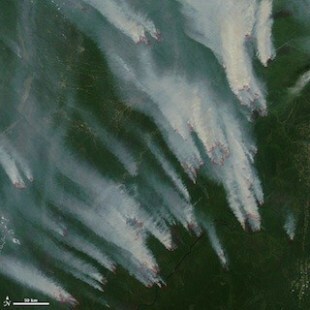 The above image, shot from space, shows scores of fires raging over the Siberian tundra where heat combined with methane seeps and lightning strikes to form a combustible brew. 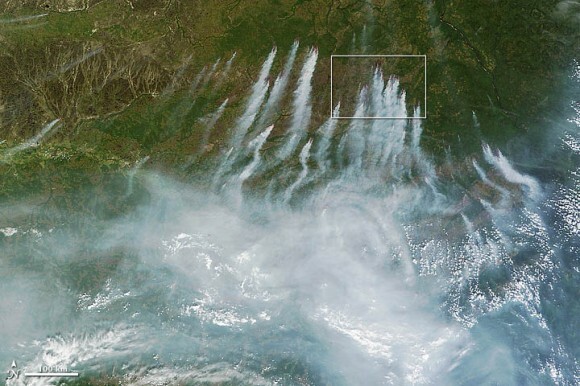 Massive smoke plumes bellowed from these fires intermingling in an Earth-spanning haze with fires all over the Northern Hemisphere. Unprecedented summer heat, five, ten, fifteen degrees hotter than normal fueled the blazes speckling the Earth’s surface like scattered embers. In the US, an enormous conflagration claimed over 350 homes and multiple lives. In Spain, the city of Valencia was blanketed by ash as a 45,000 hectare blaze roared through the countryside. 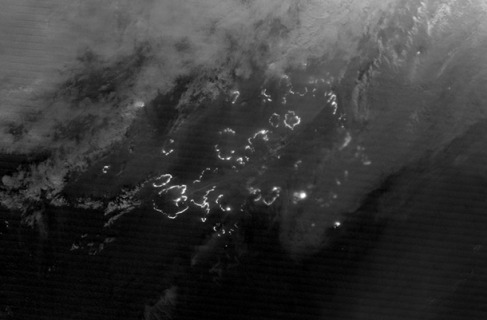 Many of the fires were massive, covering scores of square kilometers. 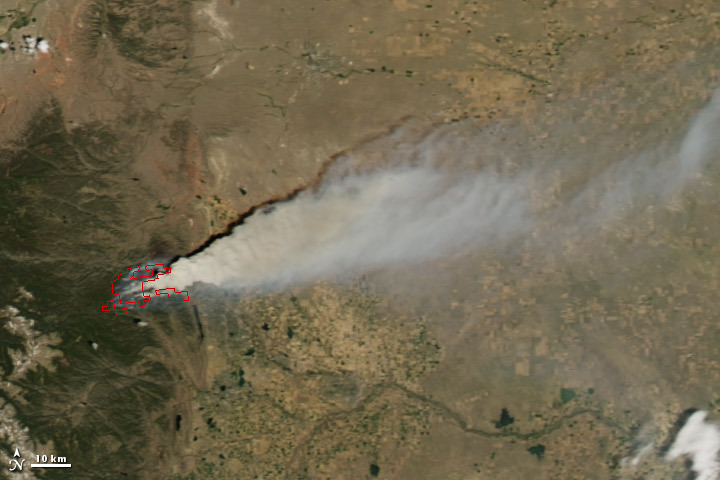 The High Park fire in Colorado, seen in the image below, sprawled to a massive inferno covering 235 square kilometers. In Spain, Colorado, and Russia, the fires were the worst in years to decades. But that they were so numerous, all burning away at the same time, was unprecedented. If the terrible fires raging over the globe weren’t enough, massive floods again struck southeast Asia, claiming lives and making millions of people climate change refugees. 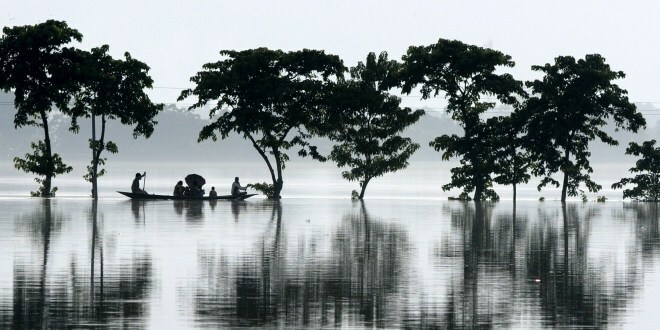 A massive flood spanning eastern India and Bangladesh left 2.3 million people homeless and killed 180. Rivers overflowed and claimed lives, often engulfing entire villages. More than 700 refugee camps were erected to shelter with the displaced. But the threat of illness abounded in the disaster’s wake. All across the United States, much of the country suffered from dry or drought conditions. NOAA’s sensors showed more than 56% of the US toiling under various stages of drought, and more than 70% of the nation experiencing abnormally dry conditions. The signal sent in most places was the same: the country was drying out. In many places conditions were expected to persist or worsen over the coming weeks and months. This continent-spanning drought threatened the largest corn crop in US history. This crop was planted, in part, to help improve US energy security, providing immense volumes of corn for use in a more than 1 million barrel per day ethanol industry, a key bastion against oil imports. Should this crop be hampered by drought it could harm both US energy security and world-wide food security. Perhaps most tragically, North Korea which has suffered from sporadic hunger and famine for more than a decade, is now experiencing the worst drought conditions in 100 years. The drought, caused by temperatures more than 8 degrees higher than summer averages, became so severe that North Korean soldiers were dispatched to aid in the watering of crops. According to the UN, this ongoing drought threatens more than 3.5 million people with starvation. Returning to the US, an unprecedented and powerful storm that many compared to an inland hurricane spawned just west of Chicago on Friday. Fueled by atmospheric instability and temperatures that, in some places, measured over 115 degrees Fahrenheit, this storm blossomed into a monstrous system spanning as much as 300 miles along its intense gust front. The storm ejected powerful volleys of lightning, torrential downpours, and winds that in some cases exceeded 80 miles per hour. Ripping through Illinois, Ohio, Kentucky, West Virginia, Pennsylvania, Maryland, Virginia, North Carolina, Delaware, and New Jersey, this unprecedented storm knocked out power to millions of customers, uprooted and ripped the tops off trees, and killed more than 22 people. The intensity of this storm was equally excessive, measuring more than five times the energy of a normal thunderstorm on the storm intensity index. Looking at the above image, it is easy to see why so many meteorologists compared this storm to an inland hurricane. Earth. A lonely world in a vast universe. And all around us, in our solar system, and even in the places barely visible through the lengthening vision of our telescopes, are dead worlds. Barren worlds. Hellish hot worlds. Strange giant gas worlds. Frozen worlds. But none hospitable to the rich variety of life all around us. There is poetry here. It is the poetry of beauty. Of singular wonder. Of a gift or of the great good fortune that we ended up here, the only place we could have come to be. It is also the poetry of loneliness and desperation. For if anything happened to this world. For if the world changed even just a bit. It becomes far, far less likely that we would continue. Change a little more and the chances for life existing on Earth grow slim indeed. In many ways we are beholden to the enormous natural forces that surround us. There is much we cannot control — the fall of an asteroid, the explosion of a supervolcano, a gamma-ray burst all would result in changes that are likely beyond the scope of human beings to adapt or overcome. But there is also much we can control. And there are many things we can do to reduce the likelihood for harm coming to our world at our own hands. There are 7 billion human beings living here. This is seven hundred times the number of hunter gatherers the world supported 10,000 years ago. In the 1970s and 1980s, sustainability experts set a cautious growth limit for humans on Earth at around 6 billion. Even at the time of the first reports, 4 billion human beings were causing major stresses to the world environment. Species loss was accelerating, resources were beginning to deplete, forests were disappearing, and pollution was creating greater and greater impacts. Loss of ozone was already a threat and reductions in the use of pesticides were needed to protect key species. It was also becoming clear that human emissions of CO2 more than a hundred times that emitted by volcanoes was starting to warm our climate. Some sustainability experts, like the authors of the ground-breaking book Limits to Growth, made appeals for building a livable path forward. A transition to technologies that did less harm. A transition to ways of living that produced less children. A transition away from dirty, dangerous and depleting fossil fuels. The hope was to sustain civilization. To prevent overshoot. To preserve a world hospitable for human life. But few people listened and few of the policies were enacted. Now, we are in a situation where resources are rapidly depleting, arable land is shrinking, and the climate is growing increasingly hostile. We live in a world of social, political and national unrest. We live in a world of resource wars. A world where the number of refugees from extreme weather exceeds the number of refugees from warfare. These instance are all signs of overshoot — a situation where the human stresses to Earth are beyond what is sustainable for a livable world. A situation where resource depletion exceeds the natural world’s ability to replace those resources. A situation where the rate of pollution, primarily of CO2, exceeds the ability of sinks to absorb it. A situation where the pollution sinks are filling up and starting to become sources. The Global Footprint Network makes yearly estimates of how many planets would be needed to support human consumption. And their estimate is that currently 1.5 Earths would be needed to sustain our recent activity indefinitely. 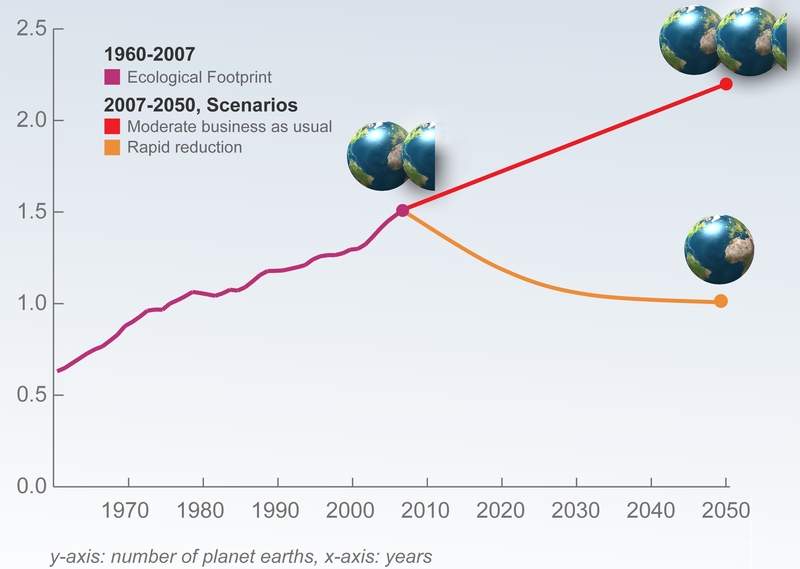 Looking forward, under business as usual, Global Footprint estimates that 2.2 Earths will be needed by 2050. Since there is only one Earth, this level of overshoot cannot be sustained indefinitely. And pushing Earth too far beyond its limits results in irreversible damage and a contraction of the world’s carrying capacity to .8, .5, .3 or even zero Earths. Overshoot for too long means we could, potentially, remove ourselves from the planet. Returning to sustainability means both change and reduction. And, perhaps, this is why it is so unpopular. A drunk or a drug addict doesn’t like to be told he or she needs a change in behavior. And we have grown drunk on growth, addicted to fossil fuels, hooked on over-consumption, stuck in population growth without restraint. To change to sustainability means more cooperation and less competition. It means more moderate winners and far less losers. It means holding the robber barons to account. It means reducing and removing fossil fuel consumption. It means eating less meat. It means more renewable energy and more localized communities. It means more democratic rule and less hierarchy. It means more freedoms for women to control their family size and when they have children and less oppression of and violence against women. It means more compassion and less selfishness from leaders. Making a change to sustainability will be a hard lesson to learn. 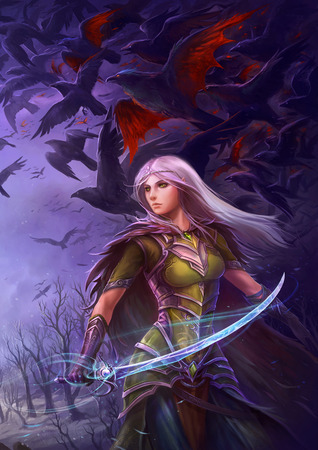 It is even doubtful that we are up to the task. But the stakes couldn’t be higher. If we fail, if we choose the path of hubris, then we risk losing our civilization, so much of life, and perhaps even our world. It is difficult to make an appeal to humanity’s better angels. But if the angels are listening, please fly to send word!